New Yamaha MT-15, one of the most-awaited naked streetfighters has finally been launched in the country at the retail cost of INR 1.36 lakh (ex-showroom, Delhi). Whilst, the bookings for this baby beast are already open at the token amount of INR 5,000. In this price range, the MT-15 will lock horns with the likes of the KTM Duke 125 and the TVS Apache RTR 160 4V. As compared to its international spec model, the India-spec Yamaha MT-15 packs a host of different features including a telescopic fork up front instead of USD forks on the International-spec model. Other than this, the cast aluminium swingarm unit on the Indonesia-spec bike has also been replaced with a box-type swingarm in order to keep pricing in check. Also, there is a saree guard associated with the tyre hugger in lieu of complying with our norms. 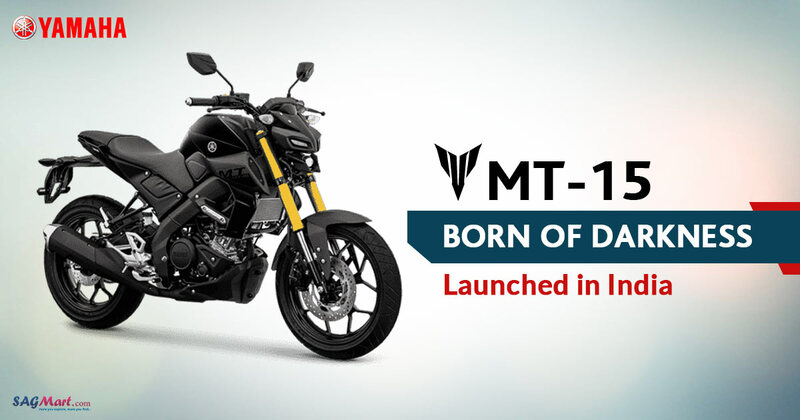 Cosmetically, the India-bound MT-15 is almost similar to its global-specs model. Its robo face like headlamp assembly upfront is one of the major highlights at the design front. The setup consists of projector lamps and LED DRLs. Other than this, the wheels here are replaced with ones being used in the lately launched the Yamaha R15 Version 3.0 in the country. The switchgear seems carried forward from the FZ25 while the all-digital instrument cluster from the R15. In addition to this, the bike comes fitted with a saree guard and tyre hugger to meet Indian regulations. From earlier surfaced images, it is being likely that there will be a matte blue shade along with the colour options like the white and black which are available in the international markets. Under the fuel tank, the Yamaha MT-15 houses a 155cc, single-cylinder, liquid-cooled motor shared from the R15. The mill is claimed to develop the maximum power of 19.3PS and 14.7Nm of peak torque. While the transmission duties are managed by 6-speed gearbox with slipper clutch for slick-shifting. For braking, the MT-15 is armed with disc brakes at both wheels, measuring 282mm in the front and 220mm in the rear wheel respectively. Whereas, to comply with the upcoming safety norms the Japanese bike maker equipped the MT-15 with a single channel ABS as against to anticipated dual channel ABS unit. TATA Harrier to Launch on January 23, 2019.